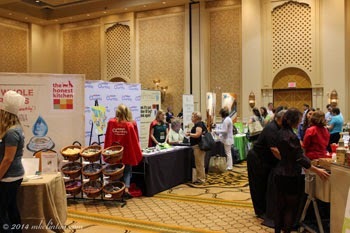 Can you believe the BlogPaws 2015 conference is only one month away? You might be wondering what you should be doing now to be prepared. I thought it might be helpful to give you a quick one-month checklist. Don’t stress over anything, you have time to get things done. Buy Your Ticket: The BlogPaws Conference is sure to be another sell-out. There are a limited number of tickets available and you risk missing out if you wait much longer. Your ticket includes meals, learning sessions, renowned keynote speakers, access to representatives from top brands in the pet industry, a red-carpet award's dinner and swag galore. You can save 10% with my Ambassador’s code BP15-Amb-Melissa-10 *Be sure to add your badge to your website. Book Your Room: This year’s conference is being at the luxurious Sheraton Music City Hotel. The group rate of $139 is only available until May 11th. Just as with the tickets, the rooms are subject to availability. *On a personal note, I strongly urge you to stay on the conference grounds. It will make going to your room between classes or after a meal so much easier. You will also want to empty your swag bag throughout the day! Join BlogPaws 2015 Conference Facebook Page: There is a new BlogPaws 2015 Conference Facebook page. You will find all of the latest news and chatter posted. things about it is the new sched.org ticket and schedule. You can fill out your profile, choose your sessions, see the other attendees, and make plans to network. Take your time a play around with Sched.org. It is really great. 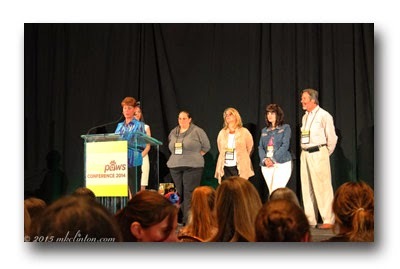 Join BlogPaws Conference 2015 Group: This is the group for all things Conference 2015. If you have a question or want to talk with others about brands, marketing, or anything pertaining to the conference, this is the place. Join BlogPaws Conference Newbies Group: I’m the newbies ambassador so if you are a first timer, join our group to learn what to expect, wear, pack, etc. *At the conference, please look for me. I’d love to say hello and visit during breakfast. We will have dinner tables set-up to help those of you that are new to meet others. This was one of my favorite times to visit over coffee. You are always welcome to pull up a chair and break bread or cheesecake with the newbies! Read Your Weekly Conference Newsletter: Check your email each week for the latest happenings and insider information about the conference. You don’t want to miss a single edition. *If you have registered and haven’t seen the newsletter, be sure to check your spam folder. Watch the Google Hangouts: Each week, BlogPaws Google+ Hangouts feature some of the speakers you will have the opportunity to hear in Nashville. When you watch live, you can have your questions answered on air. If you aren’t able to attend, you can watch them at your leisure on YouTube. You will gain something from every single episode. I love them and I’m sure that you will too. Business Cards: You need to get your business cards ordered. You can design them yourself on Microsoft Word or Photoshop. If you aren’t comfortable with that, there are many options online. Most of them have ready-made templates. You can also have them printed locally, but I find the prices higher. Follow this Pre-Conference Linky Party: The blog links below contain posts that pertain to the BlogPaws Conference. Hop around and find out even more about all things conference! Of course, you still have time to join Bentley as he picks up his friends to go BlogPaws Conference Cruising! 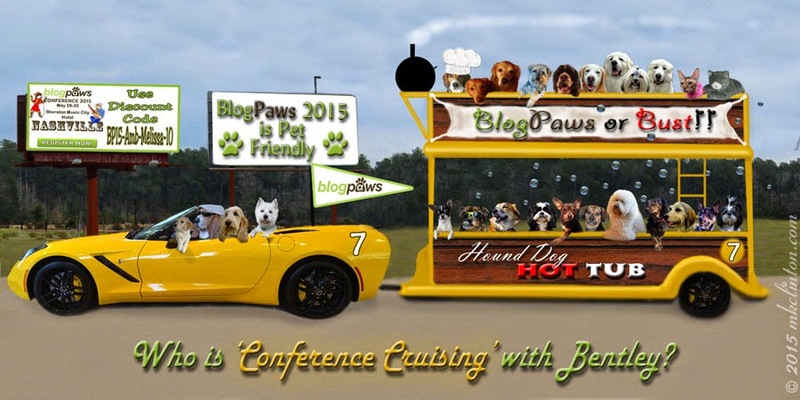 Y'all are never going to believe who is BlogPaws Conference Cruising 2015 with Bentley. It's our very own Pierre! He has decided to join us along with Bentley for the trip to ‪#‎Nashville‬. He gets his day in the Corvette along with Groovy Goldendoodles Jax, and Bentley's sweetie MyGBGVLife Emma. Dog Mom Days - Wynston AKC Chihuahua Oz the Terrier and DOGthusiast: for dog enthusiasts Mort are happy to have K9 Carry All Kona in the Hound Dog Hot Tub! Irresistible Pets Chuy Beagles and Bargains Luna and Jax's brother Harley are enjoying the scenery. Dolly the Doxie is discussing Pierre's arrival with his frequent date and Emma's sister Bailie. Mort's brother Tig and Oh My Shih Tzu Riley are catching some breeze in the back of the hot tub. It looks like Today's GrillMaster is Life With Beagle Lulu! Charlie and Harley from My Dog Likes are waiting for a sample. Denise Gruzensky's cutie pie Shasta is leaning toward Fidose of Reality Dexter. Golden Woofs Sugar is getting to know It's Dog or Nothing Atka and Mauja. Sandwiched between the two Newfies is our friend Rocco from To Dog With Love. Our two cool cats, Coco the Couture Cat and Stunning Keisha Plush CK are cooling off from their time at the grill. Get your paws on a BlogPaws ticket and enjoy meeting all of these great pets in addition to a three-day social media learning explosion! *Click to enlarge photo. Today is the Pet Parade Blog Hop! We have grown from just a few blogs parading with us to a May Day sized parade each week! Join the fun with Rascal and Rocco, Bionic Basil’s Blog, Jan’s Funny Farm, Love is being owned by a Husky, and me to celebrate. Grab our badge and hop along! That's a busy time... and we wish we had to do all that things and could enter your trailer to blogpaws... hey, that's amazing how much furfriends sit in your car and on your trailer... wow! We have our new collar and leash sets all squared away, business cards in order, media kit, check. All we need to do is pack some clean undies and hit the road! Wow! Look at all who is going! I cannot wait! Very informative. One day . . . I'm sure that the conference is going to be pawsome! I'm still working on pulling things together to be able to go. Hopefully it will work out because I love it last year and I would love to be there again. How exciting it is getting closer. That sounds like a lot of fun and excitement. I love the hot tub traveler. I don't really like water so I would be on the upper deck. I can't wait to see how it goes. Our mom needs to book her flights! She's got everything else. Our mom wishes she could go but feels like she is sort of going along with Bentley and Pierre on their bandanas. Have fun! I'm bummed I won't be able to go! I'd love to meet some of the brand representatives & fellow bloggers of course. That conference cruise is sure filling up...it's so exciting we'll be getting to meet all those cuties! I'm glad to say "check" to a lot of those things on your list, but I still feel like I have a million things to do, and can't believe we're getting down to a month away. I definitely plan to write a post at some point too about my plans and how excited I am to be going. What Do We Want Now?